Control existing weeds. Use a selective broadleaf herbicide (Weed-B-Gone or similar) to kill dandelions and clover. Wait one month before the next step. You can overseed into existing grassy weeds like crabgrass and then apply pre-emergent crabgrass killer the following spring to remove crabgrass from your lawn. Do not plant new seed if you applied pre-emergent crabgrass killer earlier that growing season. The crabgrass killer will also kill germinating turfgrass seed. Prepare surface with dethatcher, vertical mower, core aerifier, or Garden Weasel. Skip steps 3, 4, 6 and 8 if you use a slit seeder, which places seed directly into the soil. Apply seed in two directions, once parallel to the street and once diagonally. Water three times a day, ten minutes each time, at 10:00. 2:00 and 4:00, until the new grass sprouts. You want to establish a turf-type tall fescue but currently have K-31 tall fescue. You have unwanted spreading turfgrass like bentgrass or bermudagrass. Lawns that have more than 50 percent desirable grass, but appear thin and patchy, may be restored without overseeding. Apply a selective herbicide to take out the weeds and apply Turf Maximizer fertilizer three times a year. Your lawn should regain density and beauty. If not, you can always renovate the following year. Bare patches less than 4 inches in diameter likely will fill in on their own. Slightly larger dead areas can be overseeded by hand with a Garden Weasel. Shaded areas of lawns with thin turf and exposed soil often need additional seeding. Renovate these areas but do not kill existing turf. Prepare surface for seeding. One of the most important steps in renovation is placing the seed in contact with soil. This sounds simple, but most lawns have thatch - an intermingled layer of both dead and living plants - over the soil surface. if this brown, decomposing layer is more than 1/2 inch of thatch should be dethatched by core aeration or with a dethatcher. Thatch in excess of 1 inch may need to be removed with a sod cutter before reseeding. Seed placed on or in the thatch layer may germinate, but it will eventually die due to a lack of water. Use power equipment to prepare the surface for seeding. Vertical mowers, dethatchers, and core aerators are effective machines for properly preparing the surface for seeding. 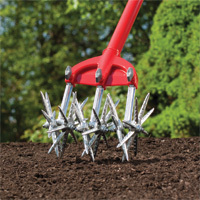 A Garden Weasel is a useful hand tool for small lawn renovation projects. A slit seeder saves time and effort because it prepares the ground and plants the seed at the same time. 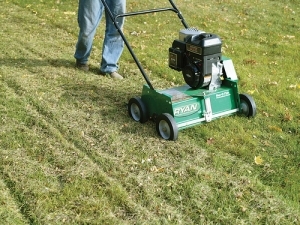 Power overseeding equipment is often available from local rental stores or Home Depot. Local lawn care and landscape companies often provide dethatching and renovation service. Heavy-duty, walk-behind vertical mowers cut groves into the soil 1/2 to 3/4 inch to help seedling establishment. Dethatchers and vertical mowers can accumulate a large amount of grass debris on the surface that should be removed so that the newly applied seed can reach the soil. After raking, a final pass with the equipment will produce closely spaced groves that are excellent channels for catching broadcast seed. 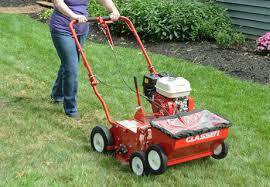 A slit seeder is a vertical mower or dethatcher with a seed hopper in front of the spinning vertical blades. Make at least two passes over the lawn; once parallel to the street and once diagonal to the first direction. this creates a diamond pattern in the slits which delivers the maximum amount of seed. Core aerifier. Coring machines have a series of hollow tines that cut several cylindrical holes in the ground 2 to 3 inches deep and 1/2 inch in diameter. Some machines will not penetrate hard and dry compacted soils. Coring machines are primarily used to provide a channel through which air, fertilizer and water can enter the soil. This channel cut through the thatch and into the soil helps to reduce soil compaction, increase root growth and redistribute soil on the upper surface of the thatch. The soil should be sufficiently moist so that the coring machine can penetrate. If a screwdriver can be pushed by hand 3 inches into the ground, the soil is about right. Soils that are too wet will clog the hollow tines and prevent core removal. The soil cores should be left on the surface to create a more favorable environment for breakdown of the thatch layer by naturally occurring soil microbes. When the soil cores have dried, they can be chopped and dispersed over the surface with a mower, verticutter or power rake. If coring is to be the primary means of preparing a seedbed, the area should be cored to produce at least one hole every 2 inches. Spread seed and fertilizer while the core holes are still open. 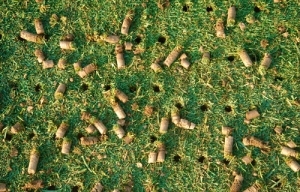 Core aerifiers are of many different sizes and shapes. As with all equipment, check to see that it will fit through the property gates before renting or contracting a service. Garden Weasel. This is a manually operated long handled tool that creates a seed bed using three star-shaped inter-meshing rotary cutters. When used properly, the Garden Weasel breaks up the ground to a 1 1/2 inch depth without removing deep rooted turfgrass plants. For best results, use the Garden Weasel to work up the soil in the renovation area first, then spread the seed, and then work up the area again with the Garden Weasel, thus insuring proper seed to soil contact in the loose soil. The Garden Weasel is ideal for use on small areas, where renting power equipment is not cost effective, or where surface tree roots preclude the use of power devices.